The City of Seward ReLeaf Tree Planting Program was implemented to help citizens purchase quality trees for planting along streets. The Tree Board takes applications for the planting of select 6 to 10 foot tree species. After the application is approved and the tree is planted, the City reimburses property owners for half the cost of the tree (up to $75). 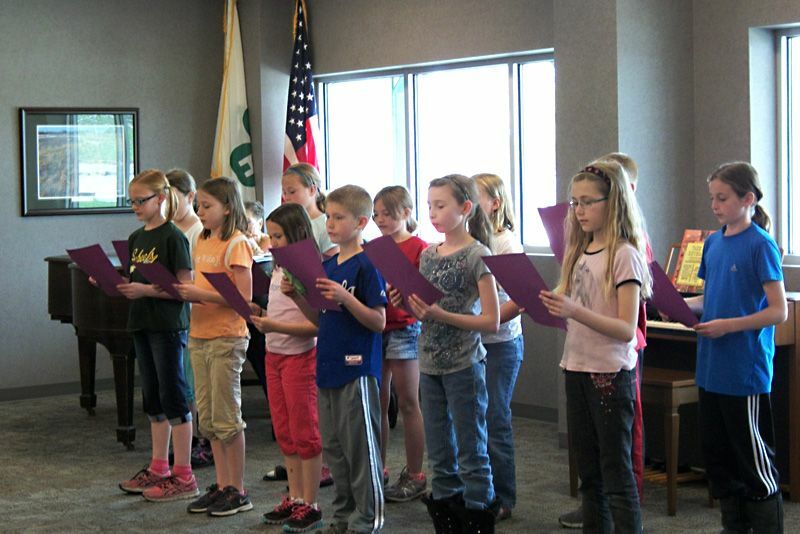 Each April the Seward GFWC Women’s Club sponsors an Arbor Day program with fourth graders from Seward schools. During the program the Mayor speaks, the Arbor Day Proclamation is signed, and awards are given for the Friend of Trees and the My Favorite Tree Drawing. A tree is also planted in a different location around Seward each year as part of the program. In the past trees have been planted at the Concordia Arboretum, the Civic Center, the Courthouse, Harvest Hall, Independence Landing, Plum Creek Park and the Schools. Is it necessary to paint tree wounds? The latest research shows that tree wounds need not be painted. In fact, painting may very well keep the wound from healing as fast as it might if it were simply left alone. In the past, painting wounds was a sign of a professional trimming job, but to this date, no wou.ld dressing has been found that will deter decay, stop insects from entering or speed healing. Should I keep grass from growing around the trunk of my newly-planted tree? YES! Grass roots produce chemicals which actually inhibit the growth of a newly-planted tree. If the grass is kept away from the trunk at least 24″ on each side, the tree will grow faster. Often, if will grow twice as fast as it would if grass is allowed to grow up to the trunk. Keeping grass away by the use of mulch also reduces the potential of damage to the tree from a string trimmer or a lawn mower. These two items kill more trees than insect and diseases put together. Under no condition should a tree be topped. Topping is NOT an acceptable method of trimming trees. If a tree is properly trimmed, it will have the same shape and character that it had before it was trimmed. Most people should be able to look at a tree that has been properly trimmed and not be able to tell that anything has been done to it. Topping reduces the life span of a tree and allows insects and decay to enter the tree. If it is done to an extreme, it can kill the tree in one growing season. If you have sandy soil, a newly-planted tree should be watered every 5 to 7 days unless there is more than 1″ of rainfall. If you have clay soil the time period should be increased to every 7 to 10 days. In periods of extreme drought, even large trees may need water. Remember, you can’t water a tree too much at one time, but you can water a tree too often. Who serves on the City of Seward Tree Board? The current tree board includes Brian Flesner, Larry Goldsmith II, Charles Matzke, Kenneth Schmieding, and Matt Stryson. They meet on the second Tuesday of the month in January, April, July and October at 5:30 p.m. at the Civic Center. For more information about the Tree Board see Chapter 2, Article 14 of the City Municipal Code.